This news section will cover everything on John Woo,from the major cover stories featured on the man and his films as well as the releases on his films on video format. 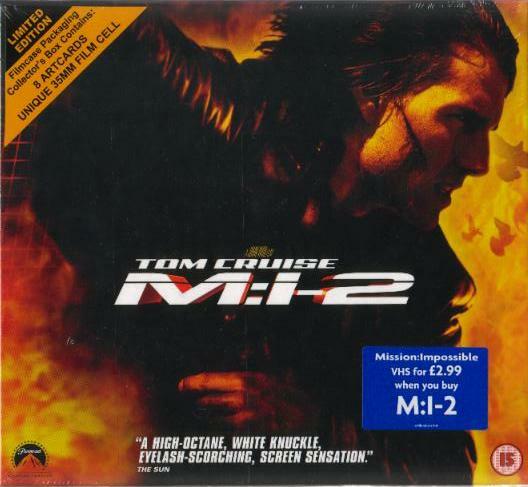 Just in time for Christmas, Mission Impossible 2 will continue it's battle with Ridley Scott's epic Gladiator in the home video sales as M:I-2 has finally been released in UK stores a few weeks after Gladiator. The R2 DVD is identical to its R1 counterpart with no extras being lost in transaction unlike most R2 cases. The R2 VHS however carries two "video exclusive" extras, an extended version of the Mission Incredible stunt featurette as well as an extended version of the Behind The Mission Interview. Exclusive to Woolsworth, MI2 is also available in a limited edition collector's box set priced at around $30, which contains the VHS of the film along with 8 artcards/lobby cards and an unique 35mm film cell. The Woolworths online site doesn't seem to list the box set down but I ensure you it's worth the trip down to your local Woolies, even if it's means you have to make your way through the seas of late-xmas shoppers. Oh and for a real threat you can also pick up the VHS of the first film for just an additional $5, how about that ! 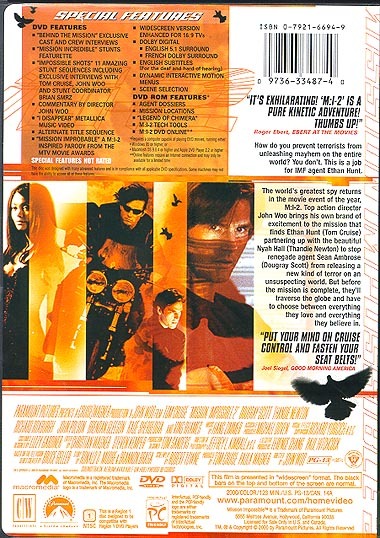 When DVD Distributor Anchor Bay Entertainment first announced that they had secured the rights to Woo's melodrama action series A Better Tomorrow I and A Better Tomorrow II, they assured Woo fans that they will try to obtain the most complete versions of the films and try to get Woo to participate in the production, hopefully with an audio commentary. Recently we found out that there will be no audio commentary by Woo as he is busy overseeing his new project WindTalkers. 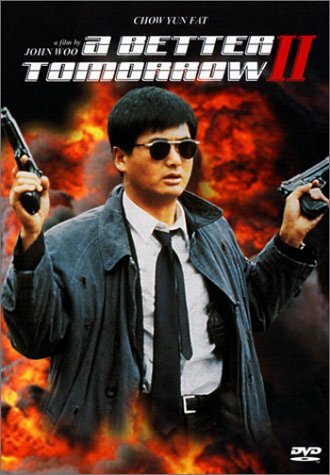 Now it seems that Anchor Bay will only be issuing standard DVD issues of both films as it's highly-unlikely that they can get hold of the full-length version of A Better Tomorrow II, or any deleted scenes for that matter. Amazon has released the DVD covers of both films and the DVDs are schedule for release on 16 of January 2001. Call me picky but image is everything, couldn't Anchor Bay tidy up their presentation and give us some better-looking covers ? My final hope is that Anchor Bay can finally do justice to the two films and release it with the original mono soundtrack. I think anamorphic widescreen is just wishful thinking right now, think to start looking for the japanese import. 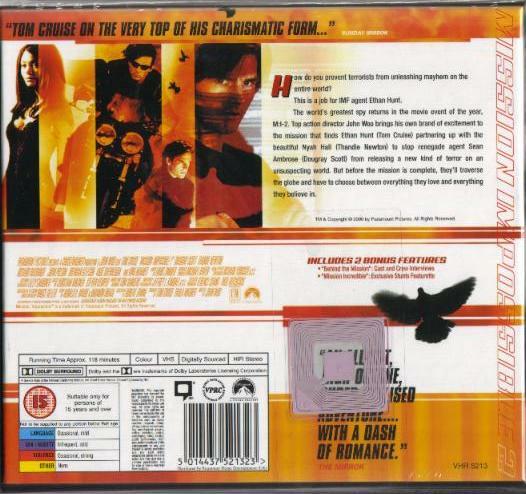 Paramount Pictures are set to release Mission Impossible 2 DVD on 7th November 2000.This DVD marks the first ever special edition from Paramount who been releasing DVDs without any extras prior to this. 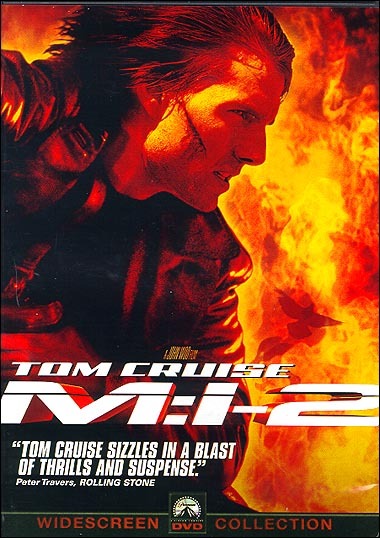 The MI2 DVD comes with an anamorphic widescreen version of the film along with an audio comentray by John Woo, exclusive interviews, stunt featurette,music video,alternate title sequence,MI2 MTV parody and DVDROM features as well. Perhaps Paramount could do a special edition of Face/Off now to please us Woo fanboys ? 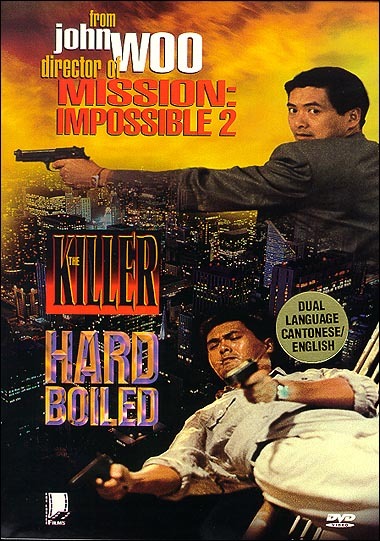 With the success of Mission Impossible 2, John Woo's most famous back catalogue films The Killer and Hard Boiled are being re-stored onto DVDs by Fox Lorber.This should satisfied the huge demand for both films on DVDs after Criterion's much-treasured DVDs went out-of-print. 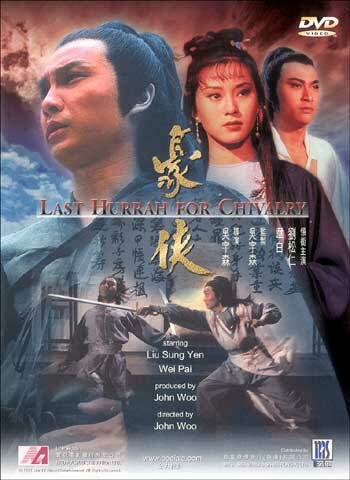 Both Fox Lorber release will carry newly-recorded audio commentary by John Woo and Terence Chang, theatherical trailer and production notes. The films are presented on non-anamorphic widescreen with original cantonese audio track as well as english dub. It's said that both films are mastered from the same Criterion prints so the end results should be about the same. 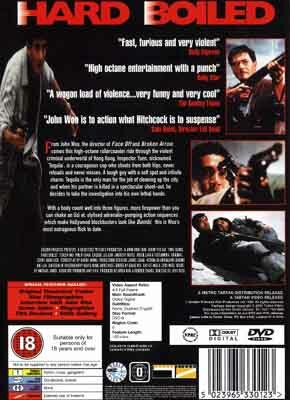 Both DVDs are schedule to be release on 03/10/2000, available separately and together in a box set entitled "The John Woo Collection". 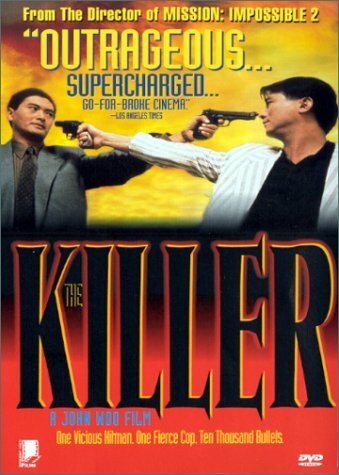 Uncorfirmed rumours from DVD Debate has it that Fox Lorber plans to release an anamorphic widescreen DVD of The Killer next year(2001). 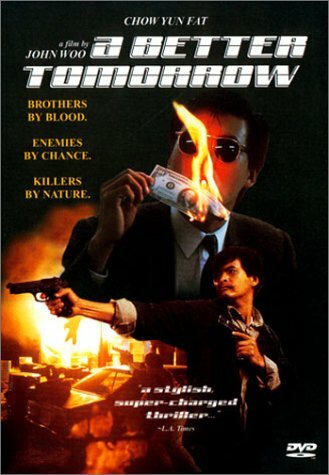 One of John Woo best pre- A Better Tomorrow films(in my opinion),Last Hurrah for Chivarly is finally given the DVD treatment as Megastar has reissue this film on their DVD catalogue. Previously available in Tai Seng's widescreen laserdisc release before going out-of-print, Megastar's release will feature Last Hurrah On Chivarly on non-anamorphic widescreen with original Mandarin and Cantonese audio track along with an English dub. 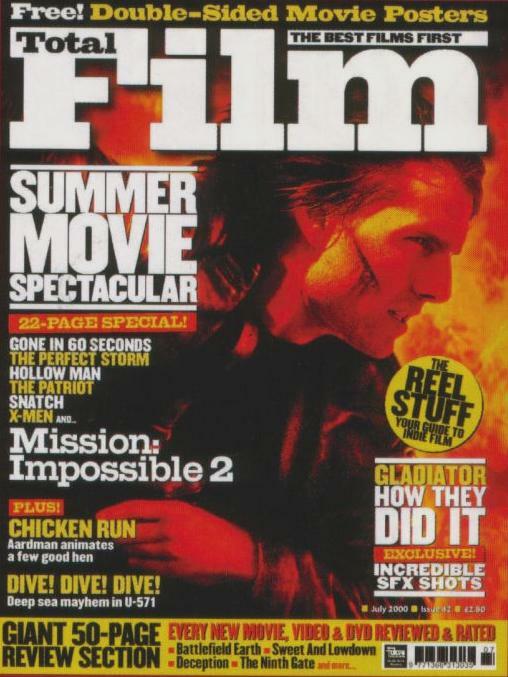 In the July issue of Flicks, Mission Impossible 2 was featured as the cover story. Most importantly, inside the cover story the actors and actresses of M:I-2 speaks of their respect for the great film director. Actor Ving Rhames says "He's extremely humble, there is no sense of 'I know best'. It's quite the opposite and to work with him is a little disconcerting because he doesn't say a lot, but after a while you realise that he only speaks if he feels the scene is not going the way he wants it to go." And for actress Thandie Newton, she was so impressed by Face/Off, she jumped at the chance to work with Woo.Thandie adds "Face/Off was a film that was very exciting in the action aspect but it always had me hooked because I could identify with the characters because he managed to bring that psychological and emotional depth to it." 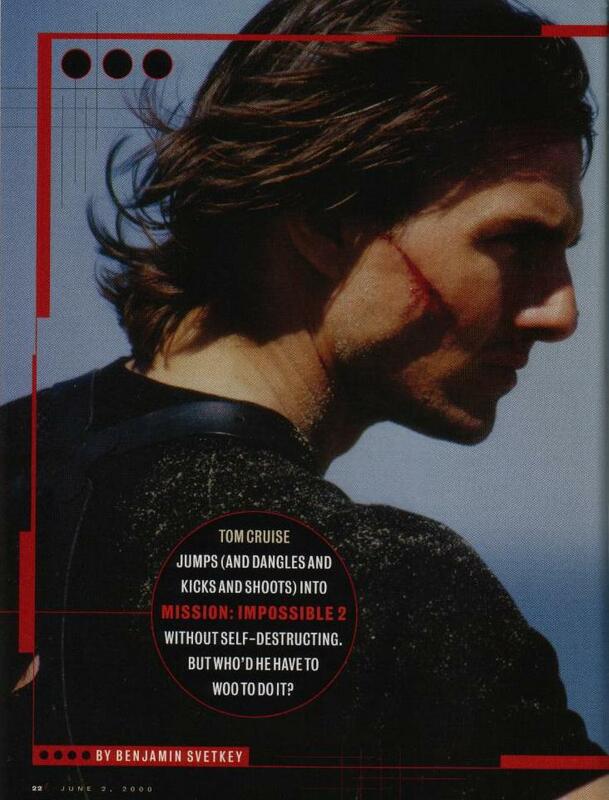 Total Film ran continuous reports on Mission Impossible 2 in their July and August issues. 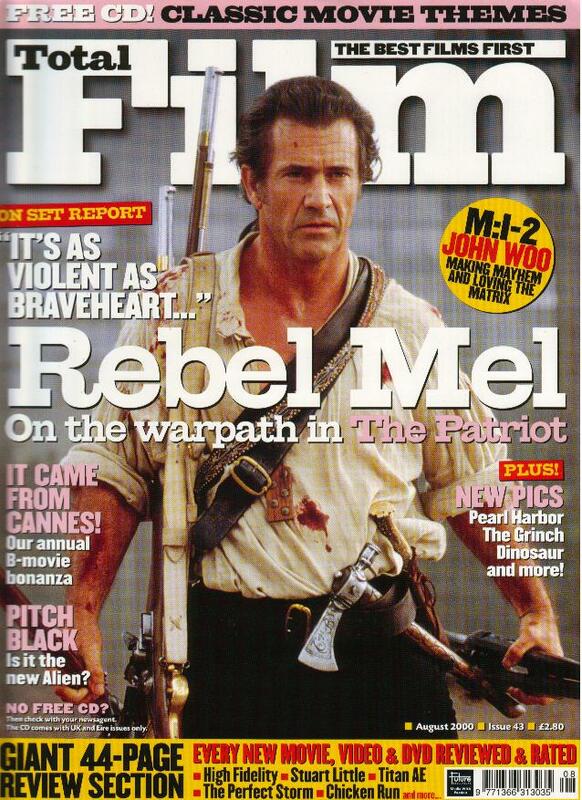 In the July issue, Total Film previewed M:I-2 while in the August issue, they speak to the man behind the film, John Woo. In the interview, Woo speaks of his thoughts on The Matrix and the first film.Also, Woo revealed the idea behind the car chase between Nyah and Ethan at the start of the film. "Originally the scene after Tom and Thandie's characters met at the party was Tom trying to convince her to work with him and in the script, it was them talking in a room. I said, talking in a room is boring, let's have a car chase. The symbolism of the car chase is more romantic and it's also funnier. And the spinning of their cars is a metaphor of their love, it's almost sexual." The full interview can be found at Total Film. After a month and a half since it's US release, Mission Impossible 2 opens in UK cinemas today. The film went on premiere on Wednesday (05/07) in UCI Empire cinema Leicester Square where stars of the film like Tom Cruise, Dougray Scott and Thandie Newton were seen present. 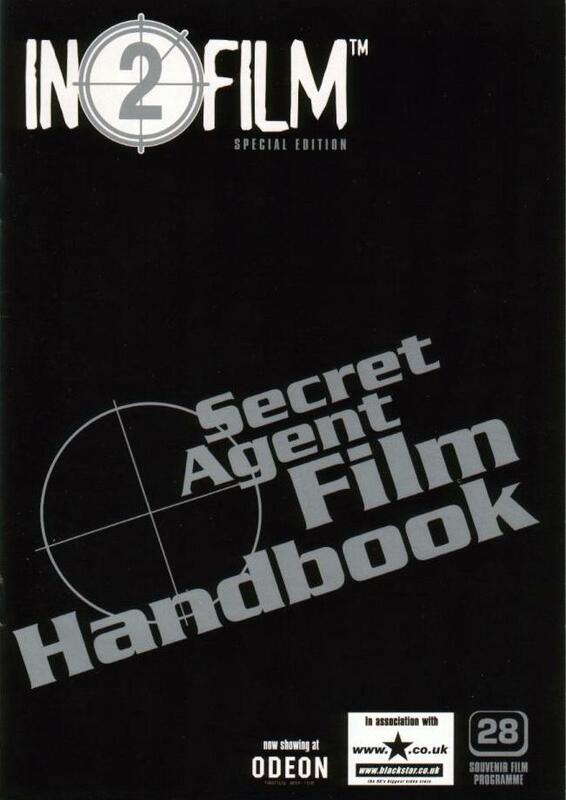 Major UK cinemas like Odeon regularly publish a souvenir film programme and this month, they published a special edition Special Agent Film Agentbook which features an interview with M:I-2 producer Paula Wagner and also M:I-2 soundtrack producer. 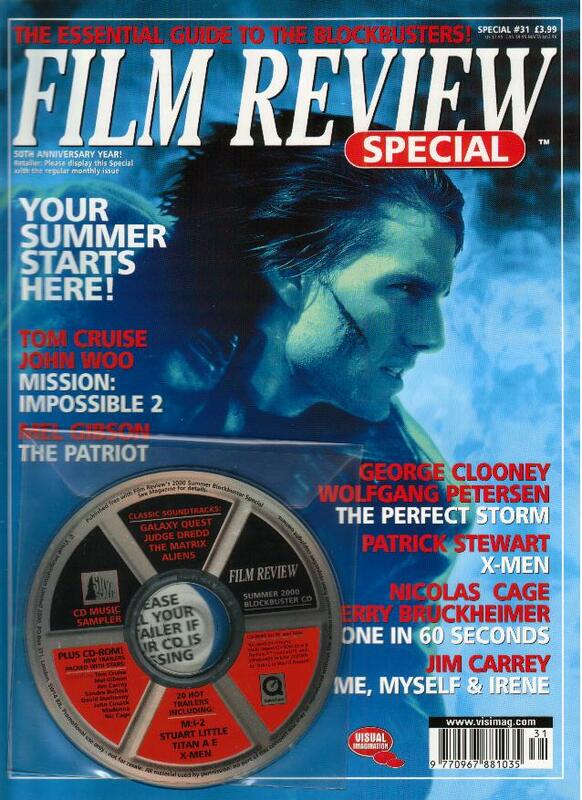 Film Review unveil a blue version of the Mission Impossible 2 poster in their Summer Special Edition. 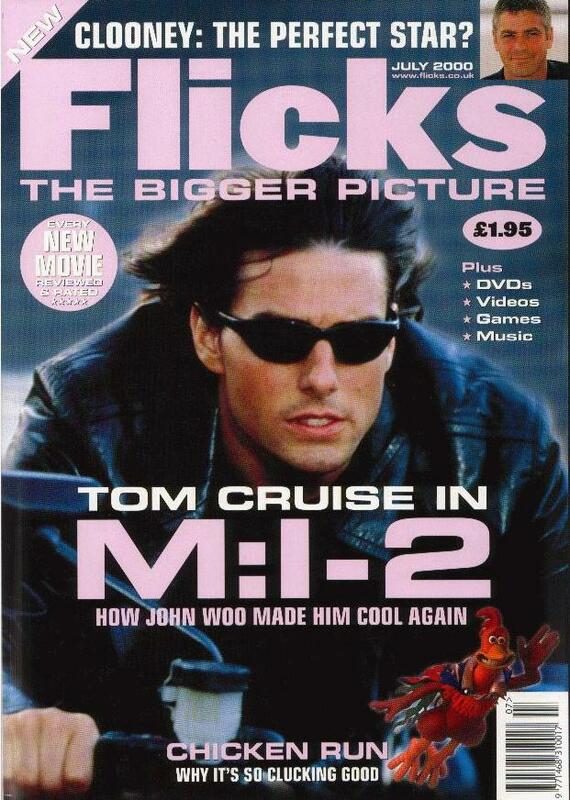 The magazine also comes with a free CDROM which features for the summer hottest films like M:I-2, X-Men and Gone In 60 Seconds.Inside the issue, director John Woo talks about M:I-2 and also mention his experience working on TV films (Blackjack and Once A Thief). Woo reveals "I wanted to learn something I hadn't done before.The thing I didn't like about television was the control of the studio. The television people contol everything.They let you know what they like and there are so many rules. You can't do this,you can't do that. There were so many rules and I couldn't handle it. As a director I need to have creative freedom." In their June issue, Asiaweek writer Winnie Chung calls Mission Impossible 2 a success and went on to reveal more on the upcoming Wind Talkers and also King's Ransom. According to Woo "Wind Talkers will be a big picture but not a blockbuster.It's not only about war,but about how people can develop from adversaries to become friends.The budget will be around $100 mil. I cannot continue just doing action films,I don't think my fans will like to see me limited to that." Can Woo become both a commercial and cult success? I certainly hope so. As for King's Ransom,Woo announced that "I think a lot of fans would like to see us [Woo and Chow] work together again.I'm hoping that King's Ransom will help Hollywood see Chow's true quality and talent. A lot of people already recognize that he is a fine actor and not just a star. We need to develop from there." 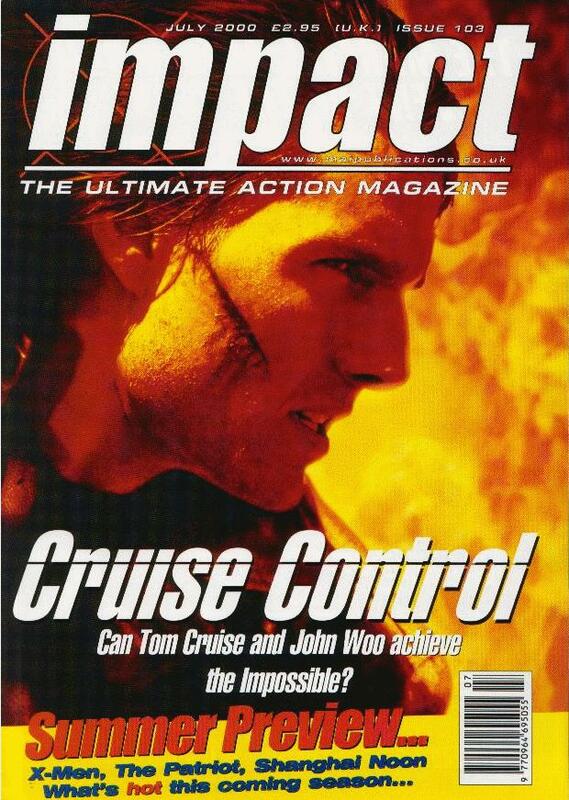 Long time UK John Woo supporters, Impact covered Mission Impossible 2 in their July issue where John Mosby gives a very reasonable review of the film.This review is particularly refreshing because Mosby seems to understand and know of John Woo's previous works and is not judging him solely on Mission Impossible 2 like most reviewers do. 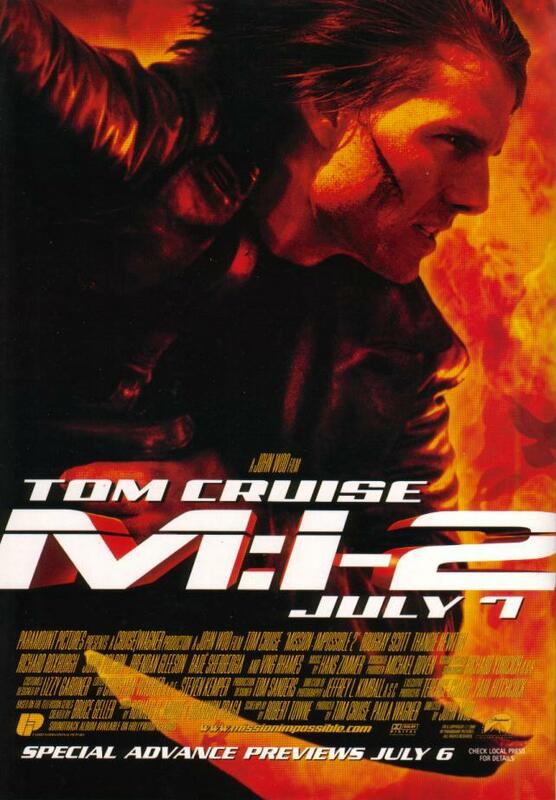 Mosby writes "When comparing Mission Impossible 2 to other John Woo films, it suffers. 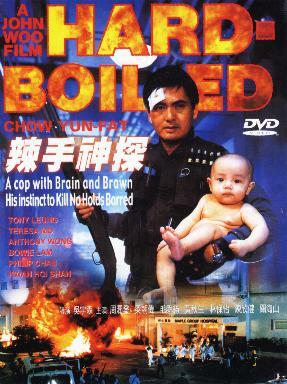 Though early US films by Woo (Hard Target and Broken Arrow) were no cutting-edge affairs, there is no denying that the more recent Face/Off, echoed the kinetic and cinematic style that had made the director such a force in the East.With Mission Impossible 2, he once more seems to be restricting himself, or being held back,producing unsurprising and very basic action sequences." 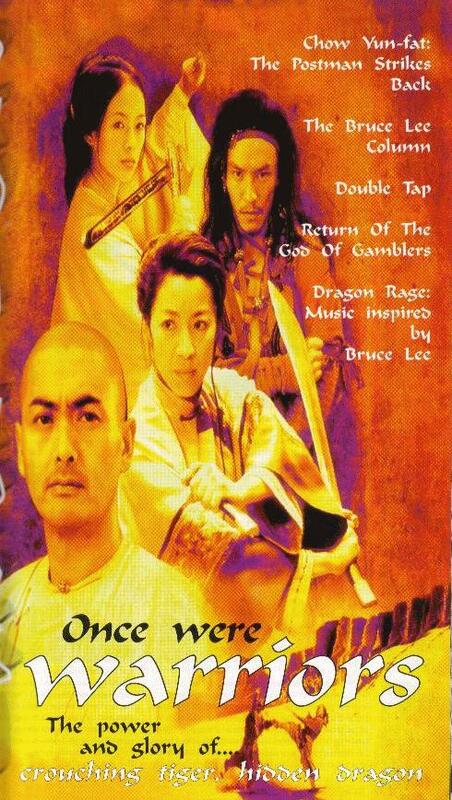 Also featured in this issue is a preview look at Chow Yun Fat's kungfu fantasy epic Crouching Tiger Hidden Dragon. 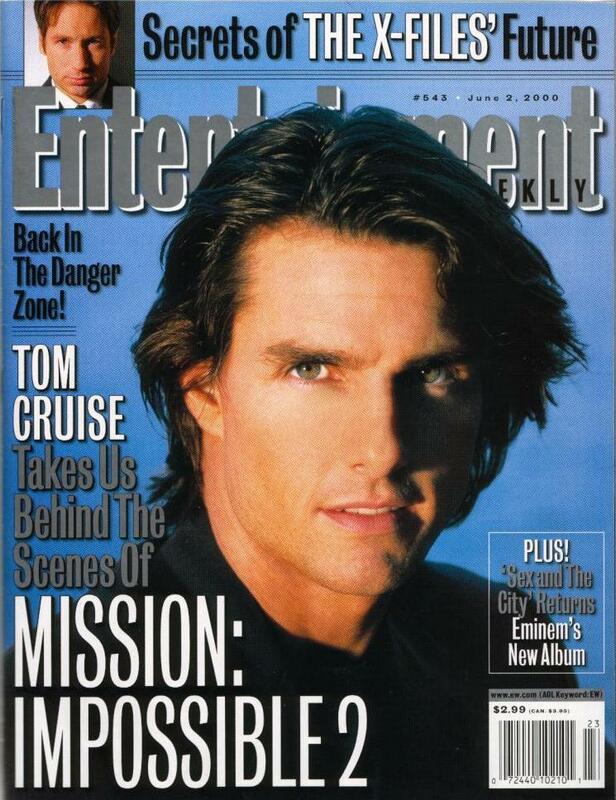 A week after it's US release, Entertainment Weekly publish one of the first of the many Mission Impossible 2 cover stories to come. 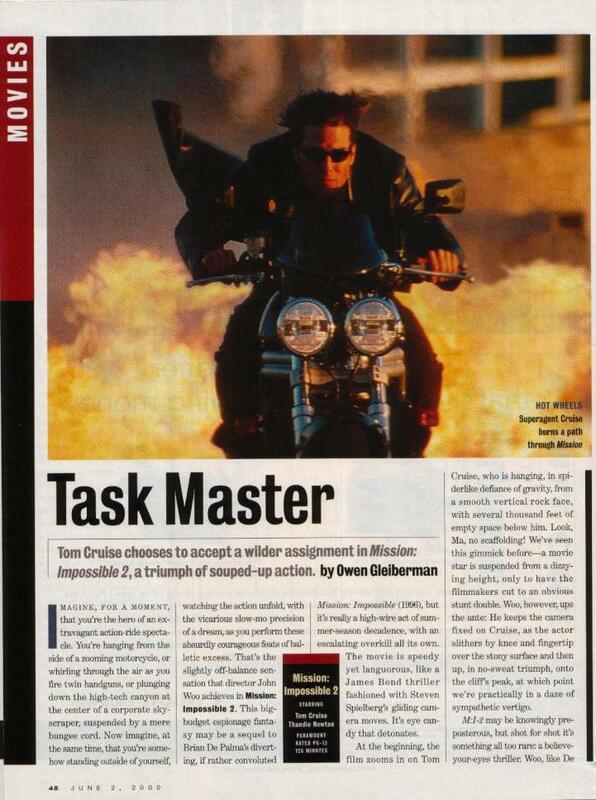 This cover story is certainly one of the best around, it features both Tom Cruise and John Woo talking about the production of M:I-2 plus lotsa of lovely color pictures. 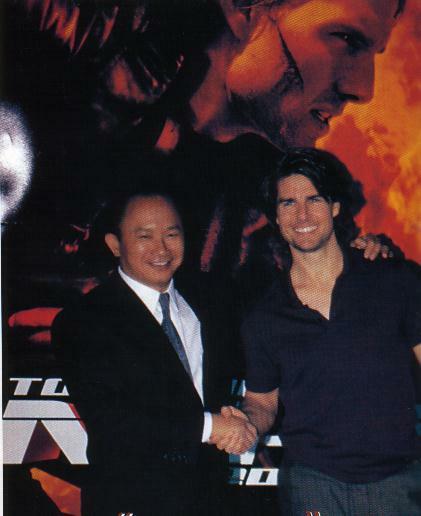 When asked about the ideas behind Mission Impossible 2, John Woo reveals that "I came up with the motorcycle chase.I wanted something really fast because Tom has such great energy.The airplane crash was Tom's idea and we both liked the rock-climbing idea." 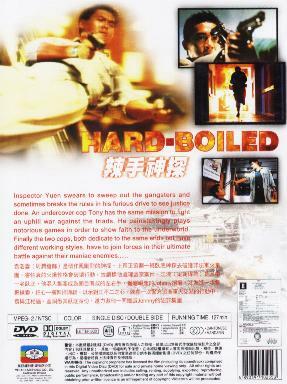 Following Criterion's discontinued Hard Boiled DVD, Mei Ah HK released Hard Boiled on DVD earlier this month, making Hard Boiled the John Woo film most widely available on DVD with at least three versions available in the market. The Mei Ah version will be double-sided flipper disc however Mei Ah is wise enough to included original mono soundtrack along with the remixed 5.1 stereo soundtrack.The running time is 127 minutes so it should be the complete version and not the 120 minutes cut released on Hong Kong LD. Also included in the Mei Ah DVD is a trailer for the John Woo-produced Peace Hotel which should be released under Mei Ah next month. 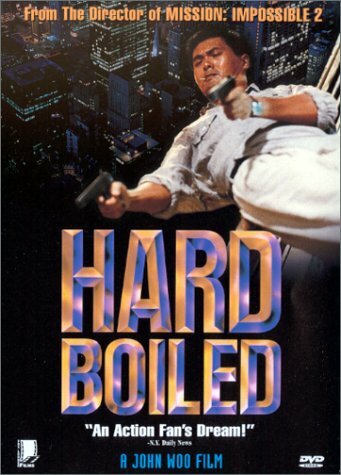 Hard Boiled is coming to UK shores on DVD,released under Tartan Video who also happened to release the film on VHS subtitled version with bonus trailer and interview with John Woo. The DVD will be 4:3 fullscreen and dubbed however the interview and trailer will still be included as bonus materials along with a stills gallery, reviews and interview transcripts with Tony Leung and Chow Yun Fat. A bit too pricey at around US$36 but Tartan Video used a pretty good print of the film and the interview is very insightful. Hard Target DVD is finally release in UK almost a year since it first came out in US.The region 2 release however should be worth the wait as it's the extended 98 minute version which happens to be 3 minutes longer than the official US version. Not much longer but it's far better than watching the full-length workprint which always comes with an unspeakable picture and sound quality. As for extras, region 2 seems to be following region 1 release with just the standard trailer and production notes. 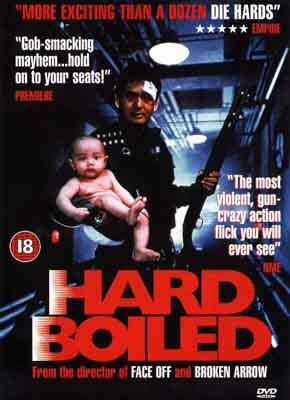 Hard Boiled, would be nice but I guess Universal doesn't have rights to that. Unlike the region 1 version of Hard Target, region 2 will not be anamorphic widescreen so I guess "you win some and you lose some".